Avebury is the site of an enornous henge and stone circles. 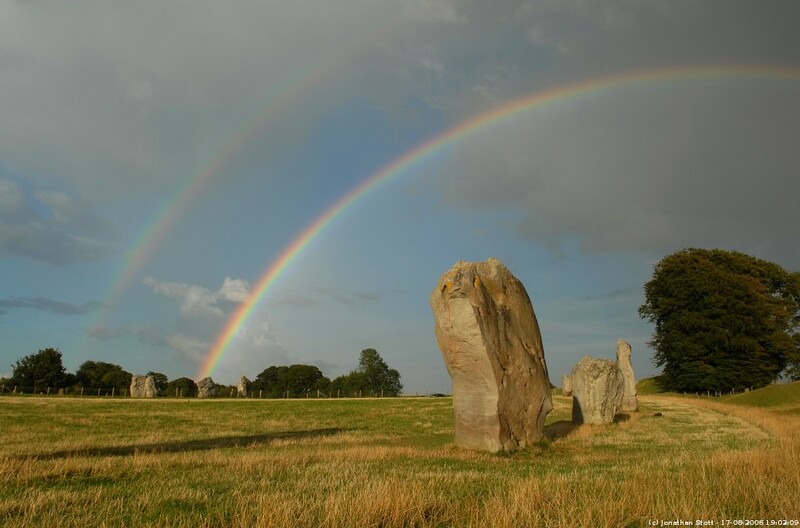 Dating from around 3000BC, Avebury is one of the finest and largest Neolithic monuments in the whole of Europe. The ditch is some 421m (1380ft) in diameter and has a circumference of 1350m (4430ft). The Outer Circle is the largest Prehistoric stone circle with a diameter of 335m (1100ft) and originally contained 98 stones, some weighing in excess of 40 tons. The Northern Inner Ring and Southern Inner Ring are smaller and less well preserved. Many of the stones on the site were removed in the 16th century to provide building materials for the village of Avebury. Many other stones have been removed since then for fear that the site may be used for pagan rituals. Many of the stones in the Outer Circle were in fact re-erected by Alexander Keiller in the 1930s.